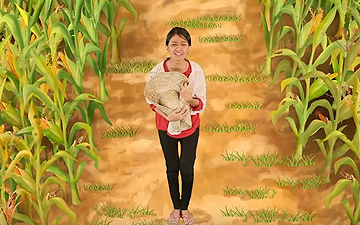 Inspired the melody of Manilyn Reynes’ hit song, a young farmer sadly sings about the losses she suffered for purchasing unregistered GM corn seeds which are of low quality. The video campaign represents the plight suffered by thousands of farmers in the Southern part of the Philippines who often fall prey to purchasing cheaper but low quality seeds. Their plights are similar to those who have purchased fake pesticides and fertilizers from unscrupulous traders in the “Ang Peke Peke Mo” campaign. This time around, CLP partnered with the Bureau of Plant Industry (BPI) to share the importance of using seeds approved by the government that have passed quality standards. In the video, Ma. Lorelle Agbagala, officer in charge, Agricultural Center Chief II of the Post-Entry Quarantine Station of the BPI reiterates the difference in using high quality grains for one’s bountiful harvest. “Education is key to reaching out to our target audience and with the use of videos and music, we want to convey our message in an entertaining platform that underscores the severity of the problem with fake and low quality GM seeds. We are hoping that this will be as effective as our previous campaigns and make a difference in the farmers’ choices,” CropLife Philippines Executive Director Edilberto de Luna said.